This is a wonderful snack that is simple to make and super addictive! ➜2 large onions, cut into rings. 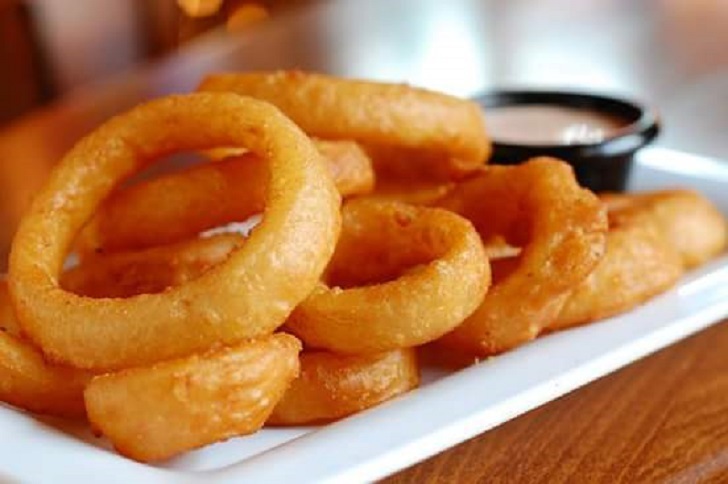 Soak onion rings in a bowl of ice water for 1 hour; drain and pat dry with paper towels. Whisk 1 cup plus 2 tablespoons flour, milk, egg, 2 tablespoons vegetable oil, and salt together in a bowl until smooth. Heat oil in a deep-fryer or large saucepan until extremely hot. Dip onion rings in the batter, working in batches, until evenly coated and arrange in 1 layer on a plate. Fry the battered onion rings, working in batches, until browned, about 5 minutes. Transfer fried onion rings to a paper towel-lined plate using a slotted spoon. Enjoy!